SAN DIEGO, Calif., March 20, 2012 - Premier motorcycle tire manufacturer Dunlop recently partnered with digital design agency Cuker Interactive to launch a new site that showcases Dunlop products and the highlights the company's rich history of motorcycle racing. 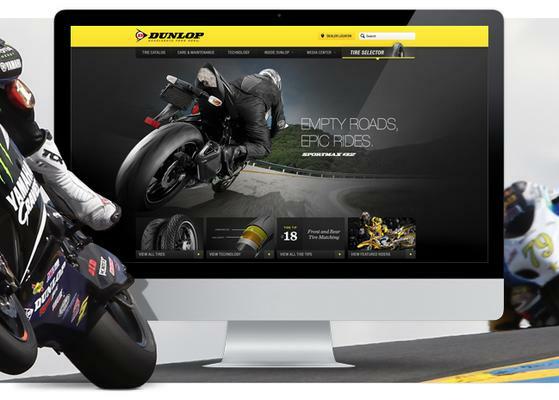 The new www.DunlopMotorcycle.com is a best-of-class website that solidifies the company's position as the leader in the global tire industry. Since Dunlop is the largest maker of motorcycle tires in the U.S., supplying major brands like Harley-Davidson, BMW, and Ducati, the site includes an easy process for tire selection. The interactive fitment guide helps consumers choose the right tire for their particular make and model of bike, while the product detail pages provide comprehensive tire information, with zoom, alternate images, find a retailer, and other powerful merchandising features.